Since December 2013, Kamer Urbain has released a digital compilation of urban music that brings together 20 Cameroonian artists living in Cameroon and abroad, a compilation called KURBAIN TAPE, was born to give more visibility to its talented Cameroonian artists who are sorely lacking in any media to promote their works. It is in this perspective that this year 2017, Kamer Urbain put it in a showbiz environment where the singles replaced the albums and the maxi, in a universe where concrete projects of music are disappearing. Kamer Urbain via this compilation brings a breath of fresh air to Urban Music 237. 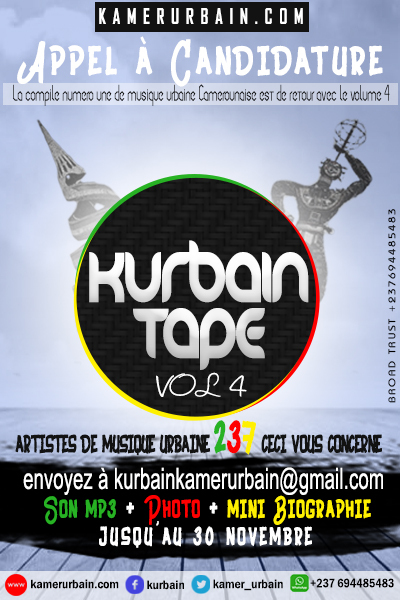 KURBAIN TAPE, which is an essentially digital compilation, aims to enhance the urban culture of Cameroon. So it is here to bring together on the same project the cream of the Cameroonian talent. The first volume of this compilation was released on December 15, 2013, and this year we are launching a call for candidates to all artists wishing to be included in the KURBAIN TAPE VOL 4.
Who is involved in this call for applications? What types of urban music will be eligible? At the end, the 20 best music will be selected to appear in the KURBAIN TAPE VOL 4, while the best ones are found in the Net Tape of Kamer Urbain.